“The initial investigation indicates that the man the officer shot had originally been in a struggle with the original suspect and had taken away the gun from the suspect. The initial suspect has been taken into custody and is not injured. No other persons were hit by gunfire. This is very early in the investigation and more details will be available at a later time,” read the report. As Amarillo.com reports, the hero of the story is a student at Faith City Mission church. 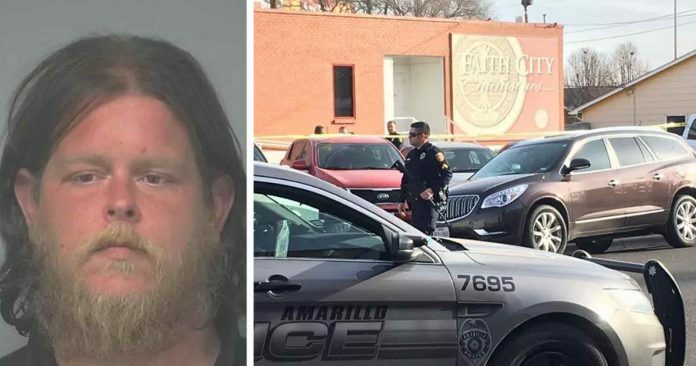 After he and the private church security officers wrestled the shooter to the ground and got the gun away from him, one or more Amarillo police officers opened fire on the student. The student was taken to a local hospital. The gunman, Joshua Len Jones, 35, of Amarillo was taken to jail unharmed. Faith City Mission Executive Director Jena Taylor said the student, who was not identified, had surgery Wednesday but was in stable condition and remains hospitalized, reports Amarillo.com. “One of our staff members visited the student that was shot and he is resting well after surgery,” Taylor said. Predictably, this story received no coverage in the mainstream media as it is showed brave citizens in a positive light while highlighting the fact that cops shot and nearly killed the hero. Please share this story with your friends and family to spread a bit of good news in what has surely been a tragic week of reporting.